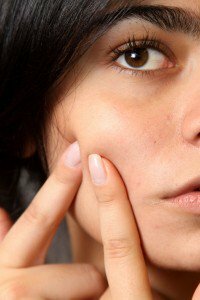 Home › Articles › Why Do We Get Acne? Agonizing over an ugly zit on your nose? Feeling like you can’t possibly go out looking like that? Desperately trying to find a moisturizer for oily skin that won’t make you break out more? Wondering what you did to deserve the acne dotting your face? These are scenarios teens and adults deal with all the time. But why do so many of us get acne? How can you prevent breakouts? Well, there’s some bad news and good news. The bad news? There are some acne risk factors that are completely out of your control. The good news? There’s still a lot you can do to prevent and fight breakouts. The first step in controlling acne, however, is understanding why it happens. Acne is triggered by a substance called sebum. Sebum is the oil your skin produces, and some skin is oilier than others. At a basic level, acne is caused by pores that get clogged by sebum, dead skin, dirt and bacteria. Whiteheads are acne bumps that are topped with a white pocket of pus. These occur when the walls of the clogged pore close up. For many people, the temptation to pick at whiteheads is almost overwhelming, but it’s really best to let this common type of acne heal on its own. Blackheads are a “flat” type of acne that is occurs when thick, waxy sebum blocks a pore, but the pore remains open. The sebum then oxidizes, resulting in a black/brown colored spot. Blackheads are often found on the nose. Pimples are raised bumps with no whitehead or blackhead, and occur when the pore opens up beneath the skin, and bacteria spreads. Pimples are often quite uncomfortable, due to the pressure under the skin, and they can easily cause scarring from picking at the skin. Cysts/Nodes, also known as cystic acne, occurs when pores open up deep under the skin. This causes large cysts or nodes that can be red, very painful, and difficult to treat. Persistent cystic acne often causes deep acne scarring that remains long after active acne is resolved. Some people are more prone to breakouts than others, and unfortunately, oily skin tends to run in families. Did your mother or father struggle with acne during their teen years? If so, you may have similar problems. Teens aren’t the only ones who have trouble with acne though. Hormone changes and other factors throughout life can often trigger breakouts. Look, if you’re one of those people who has struggled with severe acne for years, it’s probably not your fault at all. There are so many factors in play that affect how often you break out. Knowing that doesn’t make life any easier though, when what you want is results…fast. Check in with a doctor, and try some natural remedies for acne. Don’t give up! Different skin responds to different treatments. If you’re struggling with a breakout, don’t mess with it. Let it heal on its own, or talk to a doctor if it’s really bad. Once that’s cleared up, you can get down to business and work to prevent future acne attacks. First, think about your habits. That’s just the tip of the acne iceberg! There are so many everyday habits that can screw up your skin and cause breakouts. Once you know how you’re contributing to your breakouts, you can start creating positive habits to replace the bad ones. Start by addressing stress in your life: work out, try meditation, or make time for your favorite stress-busting activities. Try buying all-natural makeup labeled "noncomedogenic" or "nonacnegenic” that won’t clog your pores, and go barefaced once in a while to give your skin a breather! 1. Gentle cleansing with warm or cool water. Don’t wash more than twice a day, and avoid rubbing your skin with a towel (it just causes more irritation!). 2. Exfoliate regularly with a gentle scrub. 3. Use moisturizer for oily skin and dry skin alike. The Biconi Glow Facial Serum is a great choice! 4. Always, always use natural products! Remember: we all break out from time to time. But if you know your risk factors and minimize them when you can, you’ll find you’re dealing with those unsightly pimples less and less—and that’s always a good thing.